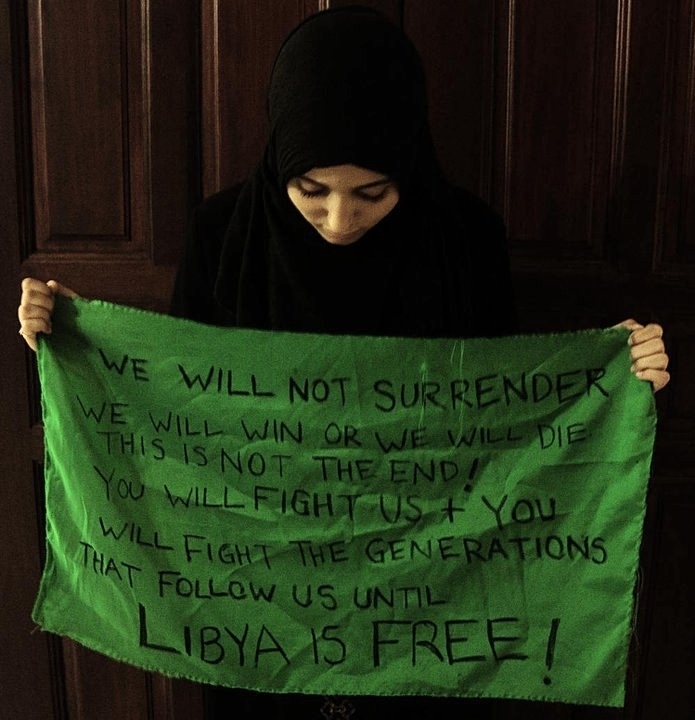 A Teenager's Photo That Helped Inspire Libya's Revolutionaries : The Picture Show Teenager Zehra Tajouri's photo of her sister holding a defaced Libyan flag, taken on the first day of the uprising last February, became an online symbol of the Libyan revolution. The photograph taken by Zehra Tajouri has become an iconic image of Libyan rebellion. The photograph was taken by Zehra Tajouri, a 19-year-old Libyan whose family fled the country when she was 6 because of her father's opposition to the Gadhafi government. They bounced around more than half a dozen countries during her childhood because her family was so worried that the Libyan government would go after them. "When the Gadhafi regime is looking for you, every Libyan knows that you run," she told me in an email interview. "So that's what my family did." She's currently a college student in China. Tajouri took the photo on Feb. 16, 2011, the day after the first protests broke out in Libya. It also happened to be the first official day of the revolution, as promoted by activists on Facebook, Twitter and elsewhere. Her goal, she explained, was to show her friends on Facebook that something big was about to happen in Libya, a country that few of them knew anything about. "I wanted people's attention," Tajouri said. "I wanted the statement 'We will not give up' etched into their mind." "I wanted to make it personal," she added. "I could have taken the picture without a model, but I realized that with the model, it made the words matter instead of just being random statistics." Her sister volunteered to model. Tajouri went about the process of scrawling her rallying cry on the flag. "I wanted to deface the Gadhafi flag," she explained. "I wanted people to see that it wasn't a flag — it was a useless piece of cloth and should be treated as such. I wanted people to know that this flag didn't represent me or anything I respected. ... I wanted to erase any meaning this flag held before. I even chose to write the message with a broken eyeliner pencil because in my eyes, it didn't deserve to look neat." "I wanted people to look it at and see how that the flag itself is ugly, but how the words on it were beautiful." When the time came to take the picture, she instructed her sister to lower her head. "The reason her head is down is that I was scared," Tajouri said. "I specifically told her to look down. I was worried that if the revolution didn't work out, we'd never be able to go back into Libya. None of my sisters would; we all look alike. And even with her head down like that, I was still worried." Even after taking the photo, she hesitated before posting it online. "I remember contemplating several times if I even should put it up, because my blog is public," she said. "However, in the end, it was my sister who convinced me by saying, 'If the revolution doesn't work out, would you really even want to go back?' "
Eventually she uploaded the photo to Facebook and her blog. "I wasn't hoping to accomplish anything," Tajouri continued. "I just wanted to inform my friends and blog readers about what was happening. I grew up knowing about Gadhafi crimes, but the outside world didn't." Within a matter of hours, her photo began to spread across the Internet. People shared it on Facebook; Libyans and non-Libyans alike used it as their Twitter avatars. It was the first photograph of the revolution to go viral. "The response I got was not what I expected at all," Tajouri explained. "The next day I received dozens of messages from people all over the world saying how they supported our fight for freedom, and how they didn't know that this was happening — how they were shocked they hadn't heard about it before." For some people, it seemed, one thing that made the photo so compelling was that it depicted a Libyan woman engaged in a political protest. Throughout Libyan history, Tajouri noted, "women weren't really known for being the face of revolutions or change or anything of the sort, so when they saw this, it was a sign of determination and bravery: 'A woman went out and did this; a woman wasn't afraid of the Gadhafi regime.' And when you see someone who you've always viewed as weaker standing fearless, well I guess that brings out the bravery in some people." Despite the fact that her photo was one of the first to capture the heart and soul of the Libyan protest movement, Tajouri doesn't feel that she played a role in the revolution. "I'm a young woman who took a picture," she said. "There are people who lost their lives for this revolution, and they remain nameless. I'm honored that people love the picture and saw it as a sign of bravery, but really, what I did was insignificant in my eyes. I wish I could do more." Now that Tripoli has fallen and Gadhafi is on the run, Tajouri is contemplating a possible return to her homeland. "I would love to return to Libya; I want to see it," she said. "I wish I could go now! I want to see how happy it is. ... My friends who went to visit now keep telling me about how the pictures are nothing compared to the feeling. I want to experience the feeling." Andy Carvin (@acarvin on Twitter) leads NPR's social media strategy and is NPR's primary voice on Twitter and Facebook.